In today’s specialized dining market, and with the proliferation of “Themed Restaurants”, Consumers have more dining options than ever before. Retailers and property owners are also feeling the pressure to provide the public with creative dining options that draw crowds. On the other hand, the options seem to be endless. But a closer look often reveals a curious pattern. Whether it is a free standing location or a retail mall food court, the options are often the same: Chinese fare, Mexican Food, Burgers and Sandwiches, BBQ Style Grills, or Pizza and Italian Food. That’s it. You can slice it, dice it, and put a fancy bow on it, but it is basically all the same and often very predictable. Consumers want options, and they demand choice. By adding Attila’s Mongolian Grill to an existing food court, retailers will greatly enhance the diversity of the food court by creating another dining option for their customers. The Attila Mongolian Grill Development Team will assist each area developer/ franchisee during the Site Selection process. 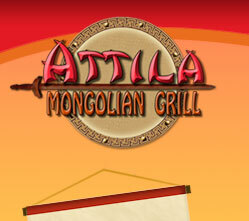 Our expertise is in knowing what factors determine the success of an Attila Mongolian Grill. These factors include location of Malls, visibility in food courts and proximity to movie theatres, and other recreational Mall activities. We combine our expertise with the area / franchisee’s knowledge of the area to determine whether an Attila Mongolian Grill will be successful and profitable in a certain area.